Sims 3 Hands-on - Moblog #2 | Juniorwood! Ewwoo! 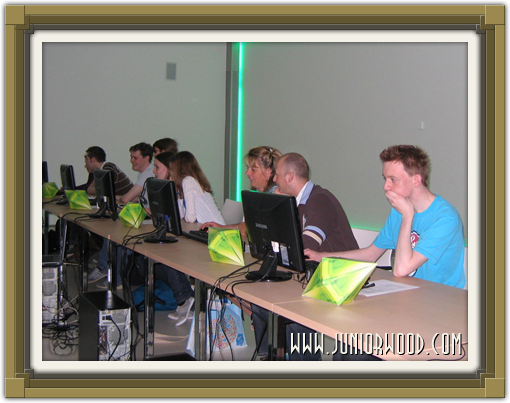 Junior is here again, now from the Jaarbeurs. Junior is taking a little break from playing the Sims 3, but it's really much fun! Junior has already seen lots of new things: careers, skills (which you can learn at the career buildings), career places that you can purchase, a lot of glasses, and Junior has also seen a bit of Riverview! Junior will also go on a picture with MJ Chun. Oh, Junior can also set the options if Sims age, how old they will be, and big automatic events like marriage and such can be enabled and disabled, and much more! Junior is really enthusiastic! But the secretaries will write more on their own sites. Now Junior will have some lunch before playing some more! Oh, finally: there is a cheat to enable Llamas in the game: enableLlamas. See you later! Lots of fans and fansites playing Sims 3! More fans and fansites playing Sims 3!